Top pop-up chef, lobster expert, and all round good guy Nicos Popupalot is back for a two night supper club at his mama's house in Herne Hill on Friday 31st January and Saturday 1st February. 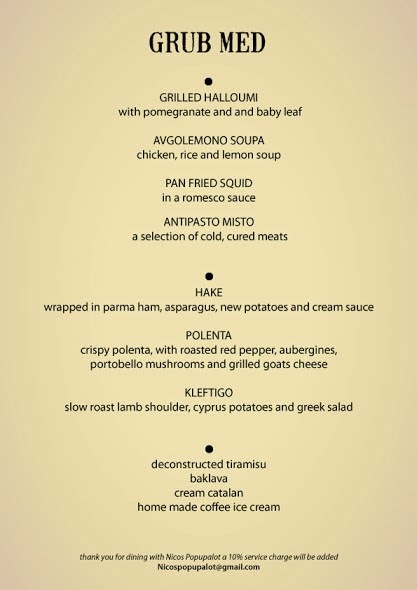 As it's all about his beginnings, the menu has a Mediterranean flavour, including pan-fried squid, and Kleftigo (slow roast lamb shoulder). Note that it's BYOB, and that a 10% service charge will be added on the night. "Nicos Popupalot presents wild, themed pop up restaurant events. Past nights have included 'The Lobster Pot' (voted in the Metro's top 5 pop ups of 2013), 'Pie, Mash 'n' Ravey' and new for 2014 we've added Grub Med, launching ON 31st January. Our aim? To offer freshly prepared food in a unique dining environment at an affordable price. Nicos started cooking in his family's restaurant at a young age and has taken his passion and work around Europe, learning all about and tasting more of the flavours this life has to offer. He has also worked in various gastro pubs and restaurants in London. Now he's bringing his experience directly to you as he pops up around London. Nicos is literally going back to his roots, where it all began in the home kitchen - MAMA'S HOUSE in Herne Hill, South East London. This supper club is for two nights only, It's a set menu of a three-course meal at £33/person. Booking is in advance only and we have a limited number of 100 tickets available. This Event is a byob"